This Collection Is A Modern Interpretation Of Nature With Branches Of Polished Chrome And Clear Glass Buds At Their Tips. Each Fixture Is Lit By Low Voltage Halogen Bulbs Nested Inside Of Clear Crystal Florets. A unique design for any dicor. This 21st-century version of a classic chandelier is suspended dramatically from a sleek rod in a statement of art-deco charm. Its gleaming double-polished chrome arms spread out and up, holding tall hand-casted champagne flutes with hand-buffed chrome stems. Modern and sleek, the Cromo collection is a stylized twist on a classic motif. We know you'll love how perfectly the white fabric shades of our Crystalline 3-Light Chandelier blend with the polished chrome to add a timeless sophistication and contemporary charm to any space. Accented with an alluring crystal ball glass finial the Crystalline collection glamorizes your personal style. Place this chandelier anywhere in your home for an instant facelift. Fully dimmable with a compatible dimmer switch you can create lighting ambiance and different moods easily (dimmer switch not included). The hanging chain can be adjusted to your preferred look and lighting needs. Includes all mounting hardware for quick and easy installation and requires three standard E26/medium base 60W bulbs (sold separately). 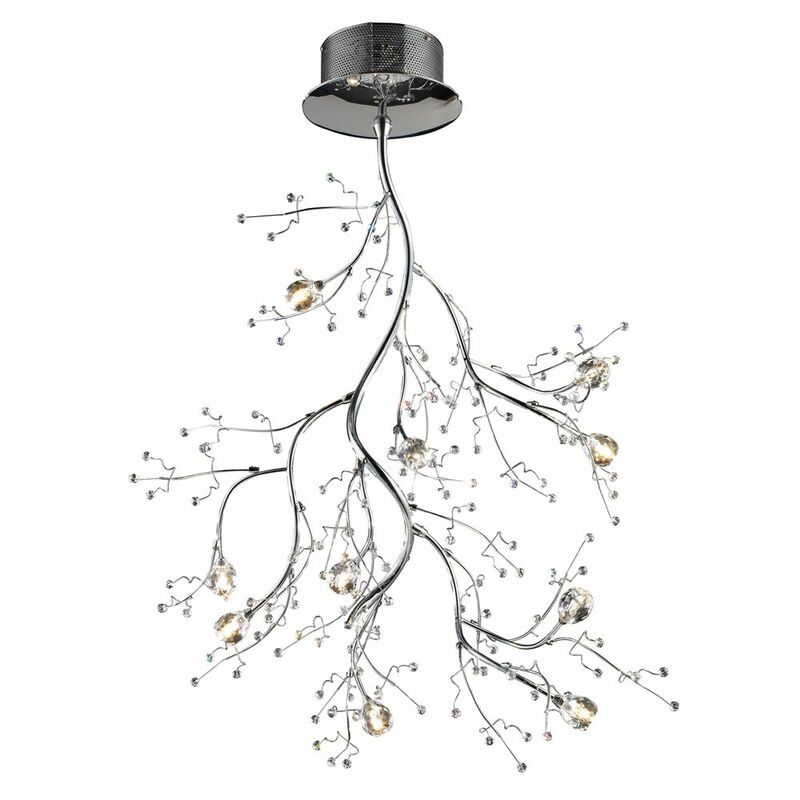 10-Light Ceiling Mount Polished Chrome Chandelier This Collection Is A Modern Interpretation Of Nature With Branches Of Polished Chrome And Clear Glass Buds At Their Tips. Each Fixture Is Lit By Low Voltage Halogen Bulbs Nested Inside Of Clear Crystal Florets. A unique design for any dicor.